A twig obelisk built in a large container planted with fast growing annual vines will quickly fill in to create a beautiful focal point or accent for your garden. Placed on either side of a rustic archway, the vines will grow up the obelisk and over the archway. 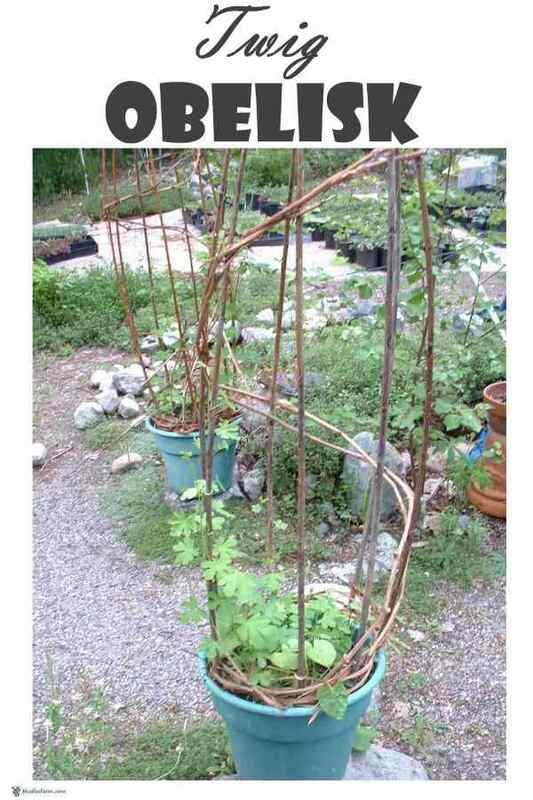 Twig obelisks can also be inserted directly into the ground and planted with pole beans for a rustic way to support your crops. The twig obelisk in the picture has several brightly coloured twig species in a spiral to support vines. A slightly different design is outlined below. 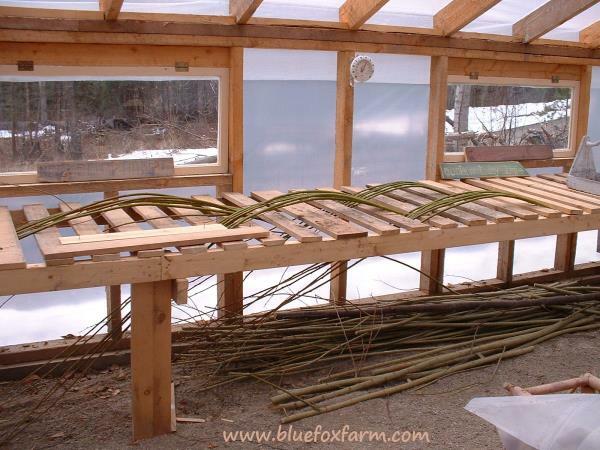 You’ll need an odd number of long straight willow or other canes, about 2 meters (6') long. An odd number such as 7 or 9 will give you the right number to weave the grapevines or other twigs around to match up at the end. Gather your large containers, such as terracotta pots, or large plastic urns, and fill with your sterilized potting soil. Pack it down quite tightly, and insert the thick ends of the canes evenly around the outside of the pot. Warning: if you're using Salix twigs they will grow roots and choke out your vines, so peel the bark off the lower 20cm (8") of the stem to prevent this, or let them dry out entirely. Loosely tie the tops together with an elastic band, or tie with a piece of wire. This is a temporary way to hold them steady while you start weaving the lower part. 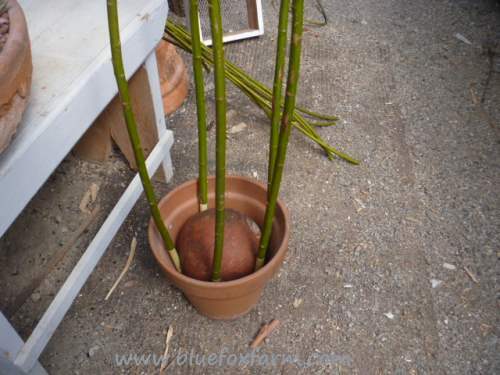 Put the ends of the canes into a large heavy pot, and hold them in place with a soccer ball or other ball. I sometimes pre-bend all the uprights, as shown in the upper picture. 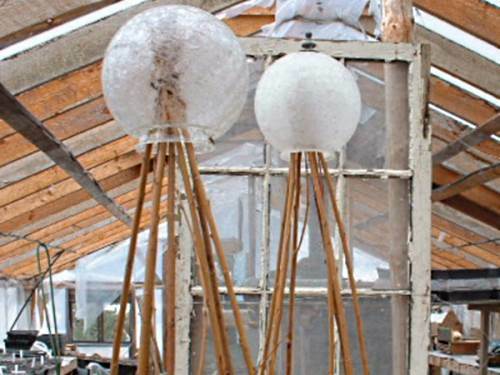 Using a long piece of clematis vine, grapevine or long slender and flexible twig, start weaving by going behind one upright cane, and in front of the next, all the way around. You can either spiral the weavers as in the picture, or do it more tightly to give more stability. You’ll see if you’ve used an odd number of canes that you can continue, and this time go behind ones that you went in front of before. Do this several times, and each time will add more strength. Pack down the weaving as you go, and once you have three to four circuits completed, simply weave the end into the previous layer to hold it. Now wind some twigs or grapevines spiral wise up the canes. 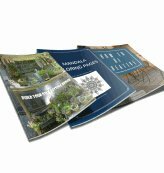 This will give your annual vines something to cling to. Take the top of the canes apart, and re-do it so that the sides of the obelisk bulge out a little, instead of being straight up and down, then wire it firmly by winding the wire around then make a pig tail of the two ends. Plant the seeds of Ipomoea, Canary Bird Vine, Sweet Peas or Pea Vine or any other annual vine, and leave in place to germinate or place in a warm greenhouse. Once the seedlings emerge, gently start to train them to climb up the obelisk, and in a few weeks they will be gleefully reaching for the sun. A rustic twig obelisk covered in the bright blooms of Morning Glory is a sight to behold.